There are many conduits of exchanging phone numbers with a single girl. Old school methods include cocktail napkins or the back of a receipt. Commonly done today, we simply place personal information into each others' cell phones. Then there are those guys who prefer to hand a girl his business card. While one of my male friends think this is rather "douchey," if done correctly, I don't mind when a guy discretely hands me his card in lieu of me reciting my number while hovering over him as he punches it into his Blackberry. Single girls like business cards because these 3.5" x 2" pieces of cardstock harbor a whole lot of information about dudes. First, a card has his full name on it - and you know how much we love learning his last name. Secondly, it includes his work information, and hopefully his occupation or title. And this helps us grant him a nickname all that much quicker when we talk about him at Sunday brunch with our girlfriends. Obviously, his phone number and email address are kinda important, too. Knowing all this information about him immediately saves us a bit of time in front of our computers Google stalking - time that is preferably spent performing eyebrow maintenance on ourselves or examining our pores in front of the bathroom mirror. Single girls like efficiency and a business card helps us decide whether we really want to go out with a guy or not. Depending on what he does or where he works, his card can either be a friend or foe. You see, a long time ago, when a man handed anyone (not just a woman he wanted to hook up with) his business card, it actually MEANT something. A business card said, "Hi! I'm important! My company spent resources printing out my name on little pieces of paper for me to give to strangers so they can call me at work! I am a big deal!" Single girls like big deals. We like seeing "CEO" or "President" next to a name. 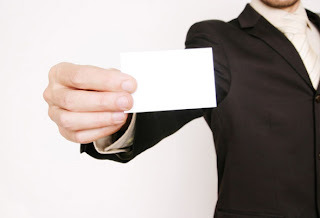 In this case, when a business card is a measure of your success, it can be your friend. But then something happened that compromised the integrity of a business card. Technology happened. All of a sudden you can make your own business cards! You can create them FOR FREE on the internet. You can even go to your local Staples or Office Depot and buy those do-it-yourself kits from Avery that you run through your laser jet printers. Single girls HATE make-your-own business cards because it's cheating. All of a sudden, anyone can be a big deal. If you are NOT a big deal, don't PRETEND you are a big deal. Example: I met a dude who gave me his business card at a Halloween party. I instantly questioned his legitimacy when he handed it to me after unfolding it from his wallet. It has a picture of himself on it. And he's not a realtor. Oh no. He is an "Actor/Writer/Producer." Those of us who live in the City of Angels know that actor slash somethings or writer slash somethings are the worst kind - they aren't very good at one thing so they have to "creatively" compensate by becoming actors slash writers slash busboys. His contact information included a link to his IMDB profile. With his personal biography. That saved me some time on Google. Another example: I met a dude who gave me his business card at an uber pretentious hotel bar on Sunset Boulevard. I instantly questioned his legitimacy when I recognized the address of his "production company" as my old apartment address. Changing "Apt. #202" to "Suite #202" did not fool me! Essentially, we not only care about the content of a business card, we also examine its quality. Whether it is embossed, matte, glossy, subtly off-white, or tastefully thick - or oh my god, is that a watermark? - we know when it comes from a professional printer and not the Epson sitting on the desk of a "home office." Guys, do yourself a favor and don't cockblock yourself with a homemade business card. Yes, it's true. Modern society has caused us single girls to evolve into shallow human beings. (Some of us should have business cards that read "Potential Future Trophy Wife.") So if your card has you listed as an "administrative assistant," save it for your next networking event and try to win us over with your charming personality instead. Great post! However, I have to say that I would rather not be involved with a CEO or Pres. because as a single girl, I'm looking for someone to spend time with me - those guys are way too busy! I couldn't have said it better myself. Business cards by actual successful business men can be impressive, but the fact that they are telling you they are impressive by literally giving you their title can be a bit off putting...after the affects of dreaming of your fancy four star dinner wear off. You basically ignore those feelings and go out with him anyway. I understand why other types need business cards, especially actors with headshots, but those should be saved for actual work and not ladies. It's not impressive. hahaha..some guy at halloween gave me a card that said his name and that fact that he is a "actor/musician/yogi/human"
how does one categorize that one?? Single Girl: what exactly do you do for a living that gives you such a disdainfully elitist view of the occupations of men you meet? I really enjoyed this article, btw...no cheap cards for me!